The Northwoods of Minnesota is a borderlands. Picture boreal forests and interconnected waterways, where fog and reflections can make it easy to mistake land, water and sky. It’s a landscape traversable by canoe in the summer, by foot in the Spring and Fall and—for the brave—skis and snowshoes in Winter. Our Boreal Gins are inspired by the wildness of this place, by its purity and its quiet astonishments. Blending foraged botanicals from the Northwoods with the backbone spices of traditional gins, they reflect what we know in our bones about Northern nature and its flavors. Our gins feature a combination of foraged wild botanicals and traditional gin botanicals. They’re not too proud for gin and tonics, but damn well good enough for sipping. They’re the perfect companion on a portage through the North country (remember, no glass!). But, if you’re not fortunate enough to experience this amazing landscape yourself, with these gins at least you can still drink it in. Our most innovative gin. A tea of staghorn sumac, infused with juniper berries, black currants, grapefruit peel, ginger, and cinnamon, rested on toasted red cedar wood for a subtle woody finish. The Christmas of gins. 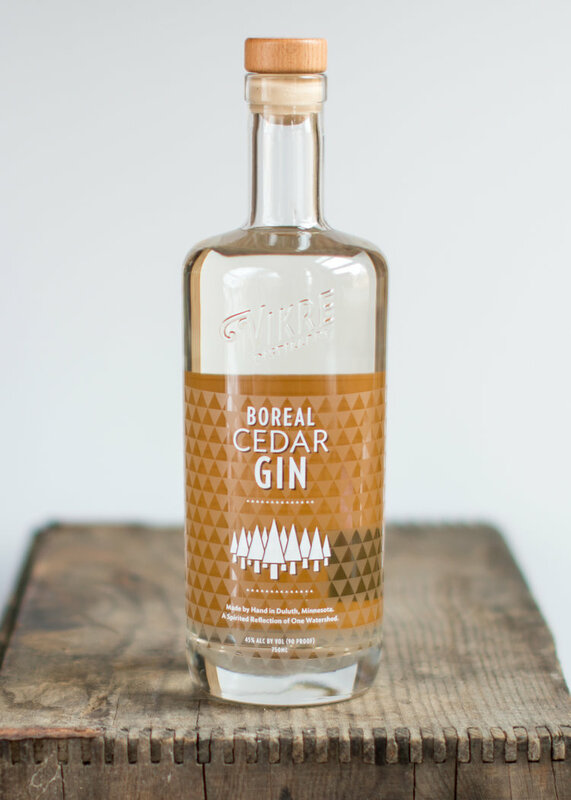 Infused with spring-foraged spruce buds and a variety of piney herbs like lavender, rosemary, and sage in addition to traditional gin botanicals. Lake Superior contains 10% of the world's fresh water. Lake Superior Vodka is distilled and cut from this astonishingly pure water plus a base of malted barley. Our vodka is deep, smooth, and clear, a fitting tribute to the Greatest of Lakes and the city at its Zenith. The warmth and shy sweetness of barley and the strong clean heart of Lake Superior water. A hint of honey and vanilla on the nose, the flavor is crisp, smooth, and memorable. Aquavit is the original Scandinavian distilled spirit. It’s infused with caraway and cardamom, fundamental spices in Scandinavian cuisine. An early Norwegian version was aged in oak barrels on ocean voyages to Australia. According to Norwegian lore, it was something magic about the two trips across the equator that made it so delicious. Call it the audacity of the immigrant, perhaps, but we tried to make our aquavit better, and more approachable, than the Norwegian and Danish ones with which we grew up. We conjured the spirit of our bearded Viking ancestors as well as the culinary background Scandinavian immigrants brought to America and rounded out the traditional caraway spice with flavors inspired by lympa—a sweet rye bread. The Ojibwe call it “Gichi-gami,” meaning “big water.” French explorers called it “Le Lac Superieur,” meaning “Upper Lake.” Following the French and Indian War, the English kept the name, “on account of its being superior in magnitude.” Lake Superior is, in fact, the world’s largest body of freshwater. Our unaged (aka taffel-style) aquavit is named Øvrevann, Norwegian for Upper Lake, or Lake Superior. Light and aromatic, it is piquant and refreshing to sip alongside smoked fish or to cut the fat after a heavy holiday meal. It’s a foundation for excellent Nordic-leaning cocktails, but can also help you weather the squalls like a Viking. Voyageur Aquavit is our aged aquavit. It doesn't get to travel the high seas (thanks government regulators! ), but it does spend over a year in Cognac barrels, an homage to the French voyageurs who founded Duluth. We start with malted barley, (like a single malt!) that we ferment and distill before gently infusing it with warm spices and then aging it for a year in used cognac barrels, which gives it a complex oaky, floral finish that makes it wonderful for sipping. 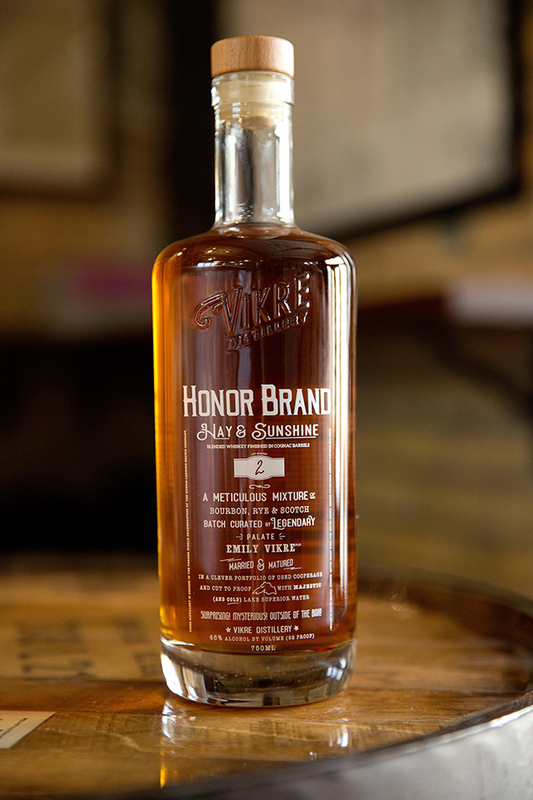 It is truly whiskey for vikings. Skål! All of our whiskey grains come from within 50 miles of our distillery. Well, except for the malted barley, which comes from Shakopee, a whopping two and a half hours away. Our new barrels come from Western Minnesota while our used ones come from our friends at Duluth Barrel Works. Our water comes from Lake Superior, right next to us. What can we say? We’re kind of in the perfect spot for making whiskey. Our whiskies hew to tradition while bending it in playful and delicious ways. We use traditional techniques but explore unique mash bills and barrel combinations to make whiskies unlike what you’ve had before. Our first ever blended whiskey. Hay & Sunshine is a blend of bourbon, rye, and Scotch, carefully curated and finished in Cognac casks to create a sippable, approachable whiskey that’s also great for cocktails. It has the friendliness of bourbon and the structure of Scotch with notes of butterscotch, fresh pineapple, lemon zest, and white pepper. To learn more about Honor Brand, check out our Honor Brand page! Our first whiskey, and, as far as we can tell, the first whiskey ever to be produced in Duluth (legally, hehe)! We age a bourbon mash in used port barrels with soft maple staves, then we finish it in bourbon casks that have been used for aging maple syrup. Light but complex in flavor with notes of maple, roasted cherry, leather, and yellow cake. Available in limited quantities on a batch by batch basis. A one-of-a-kind whiskey that celebrates the contradictory extremes of the North. We combine the peppery flavor of rye with the depth of oats, plus a gentle wisp of smoke from cherry-wood-smoked barley malt and age the whiskey in new American oak casks resulting in a whiskey that’s got plenty of vanilla and caramel balanced with hints of dried plum and tobacco. Iron Range Single Malt is a celebration of the shared history and resources of our region. This first release of single malt is the first whiskey Vikre distilled. It was brewed in collaboration with Bent Paddle Brewing Co. from 100% malted barley. After aging more than two years in used bourbon barrels it was finished in a mixture of used cooperage, including white port barrels. 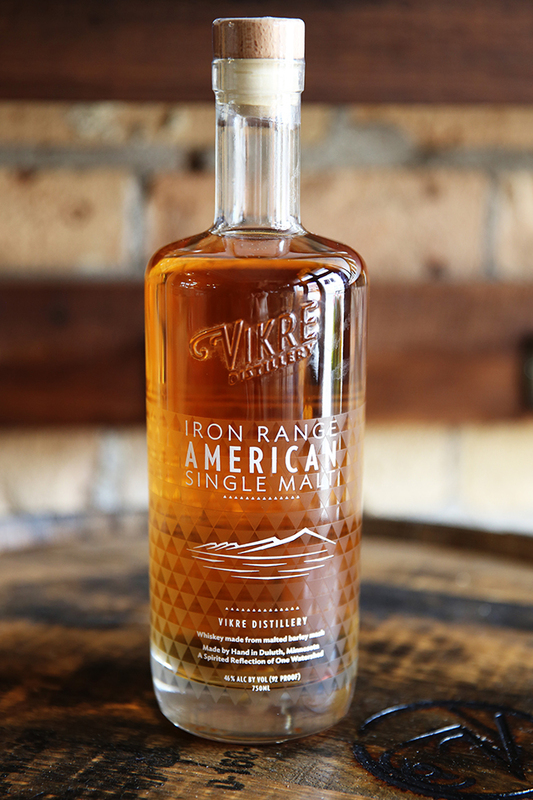 On the nose, Iron Range Single malt has notes of stone fruit, cereal, honey, and toast. On the palate it hits you with a mix of grain, dried fruit, unsweetened chocolate, hazelnuts, and a distinctive finish from the yeast. Shhhhhh. We have a few spirits still in the distilling and aging process. Coming not-too-soon it's better that way. The Star Tribune: "Destination, Duluth: What's new in dining that you don't want to miss"
NPR News Appetites: "Duluth as a food destination"
Almanac North: "Vikre Distillery Tour"
WDIO: "Duluth's First Craft Distillery"